This cross was planted in late February of 2010, and this is one of two seedlings that germinated in the tray.....a full year later! I had a feeling that these R. glauca seeds might take quite a while to germinate, so I kept the flat for a year. Good thing I did! I'm not at all sure what to expect from a cross like this, but I am quite certain there will be no reblooming seedlings here. Like many hybridizers, I am interested in R. glauca because of its exceptionally graceful shrub architecture, and its unique bluish/pink tinted foliage. (Not to mention its excellent Winter hardiness, something most modern remontants lack entirely) The Rupert-bred R. fedtschenkoana hybrid that played pollen donor also has some unique traits, including its shrubby bush form and matte foliage that, while a bright grass green itself, tends to pass on bluish tones to its offspring. If I'm very lucky, I might find this is a match that emphasizes blue-tinted foliage so valued in R. glauca. It is a difficult species to work with, apparently, and even germinating the seeds, as I have seen, can be a challenge. Further reading: Louis Riel is one of the more interesting R. glauca hybrids in commerce, and has been proven fertile in breeding. Very interesting indeed. 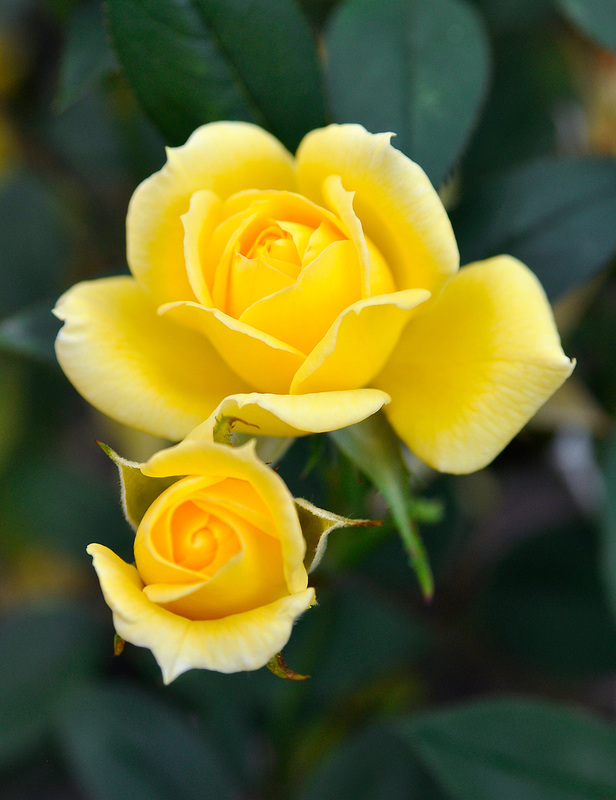 1-72-1 is a sibling to Moore's most famous yellow, 'Rise 'N' Shine'. It is in many ways a nearly identical rose except in stature; where 'Rise 'N' Shine' is a compact plant rarely exceeding 15 inches, 1-72-1 is much larger, with somewhat arching canes to three feet or more. Both roses have a beautifully clear yellow coloring that even forty years later is hard to improve upon, but of the two I think 'Rise 'N' Shine' has the more elegant flower form. At the time of their creation Moore was referring to shrubs like 1-72-1 as "climbing miniatures" in order to improve their marketability. 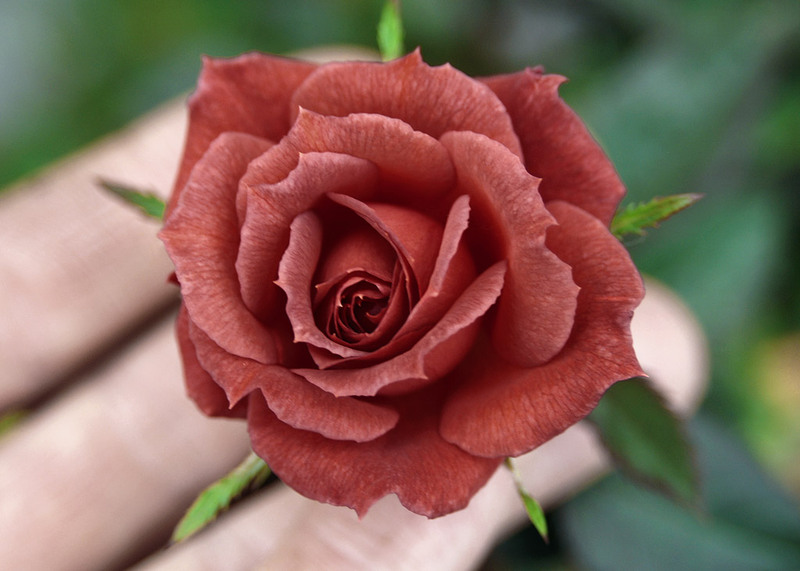 It would have been very difficult in the 1970's and 1980's to sell a "miniature" rose that grew to 4 X 4 feet! 1979: ‘Orange Cascade’: 1-72-1 X ‘Magic Wand’, Climbing Miniature, orange Blend. 1983: ‘High Stepper’: 1-72-1 X ‘Magic Wand’, Climbing Miniature, yellow blend. 1983: ‘Softee’: 0-47-19 X 1-72-1, Miniature, white. 1986: ‘Chelsea’: 1-72-1 X ‘Crested Jewel’, medium pink, some cresting on sepals. 1987: ‘Joycie’: 1-72-1 X ‘Gold Badge’, Miniature, orange blend. 1987: ‘Snow Twinkle’: 1-72-1 X ‘Magic Carousel’, Miniature, white. 1988: ‘Golden Gardens’: 1-72-1 X ‘Gold Badge’, Miniature, medium yellow. 1989: ‘Work of Art’: 1-72-1 X ‘Gold Badge’, Climbing Miniature, orange blend. 1991: ‘Vi’s Violet’: 1-72-1 X ‘Angel Face’, Miniature, mauve. 1992: ‘Cal Poly’: 1-72-1 X ‘Gold Badge’, Miniature, medium yellow. 1992: ‘Pink Poodle’: 1-72-1 X ‘Old Blush’, Miniature, pink blend. 1993: ‘Tag-a-Long’: 1-72-1 X ‘Make Believe’, Miniature, red blend. 1993: ‘Orchid Jubilee’: 1-72-1 X ‘Make Believe’, Climbing miniature, mauve. 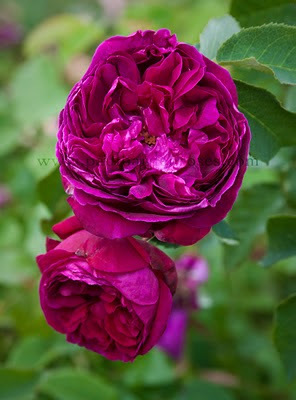 1996: ‘Sequoia Ruby’: 1-72-1 X ‘Floradora’, Climbing miniature, medium red. 1997: ‘Twister’: 1-72-1 X ‘Shadow Dancer’, Climbing Miniature, red blend. 1998: ‘Woodstock’: 1-72-1 X ‘Clytemnestra’, Climbing miniature, yellow blend. 2002: 'Star Dust': 1-72-1 X ‘Out of Yesteryear’, Miniflora, white blend. 2003: 'Lemon Pearls': 1-72-1 X 'Out of Yesteryear'. 2005: ‘Keith’s Delight’: 1-72-1 X ‘Rugelda’. There have been a number of other hybrids created by Kim Rupert in recent years, marrying 1-72-1 with R. fedtschenkoana hybrids and R. hugonis, to name just two. Kim's hybrids tend to be highly unconventional shrubs that are highly experimental yet attractive, aiming to improve the shrub architecture, while exploring new aesthetic paradigms. I too have employed 1-72-1 in my work in recent years, with various goals in mind. Most recently, I made a number of crosses using yellow breeders in combination with the AgCan breeder L83 (A. Kordesii hybrid) including 1-72-1 as one parent. I was surprised at how many seedlings displayed medium to strong yellow or orange tones from this cross. Of these, I have selected three seedlings which have superior disease resistance and have demonstrated the ability to form seeds. 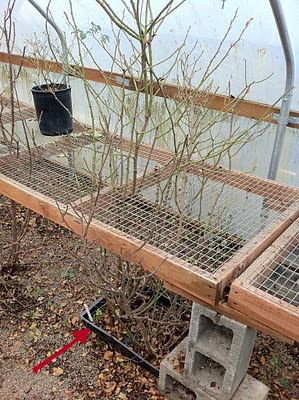 These will be used in breeding to pursue the creation of a modest-sized yellow shrub rose that will withstand cold winters and have improved disease resistance. Cleaning rose seeds, thousands and thousands of 'em, till my fingertips are stained black! When you manage a large collection of roses, especially one in which new seedlings are generated by the thousands every year (for 13 years! ), you are inclined to let certain housekeeping chores slip. Case in point is what you see happening in the photo here. Years ago, I shoved a seedling flat under a bench after I had potted up the seedlings in it. (The red arrow in the lower left points at the outline of the flat) Every year a small percentage of seeds germinate much later than their flat-mates, often not until the Fall or the following Spring. 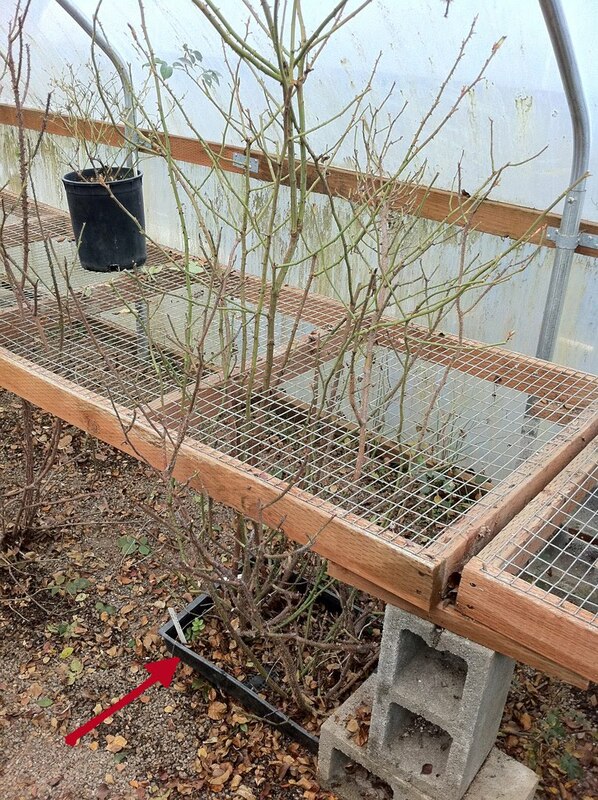 Such was the case here: the flat lay under the bench, undisturbed, and here we are 6 or 7 years later with late germinating seedlings well rooted into the soil below the flat, and sending up vigorous canes through the metal grid bench tops! Three times now I have hacked these seedlings down to stumps, and this is how they look this weekend: happy and rarin' to go. As it happens, one of these is a seedling that hasn't yet flowered: a cross of ("Lemon D" X 'Scarlet Moss') X 'Fakir's Delight', all of which are complex Moss hybrids from Ralph Moore's library of inventive crosses. So, I don't dig these out because I am waiting to see this last, late seedling bloom. At the far left side of the frame you see a hint of another seedling that escaped its flat entirely. It reaches to the roof of the house now and is wickedly thorny, although as is often the case with roses of modern Moss pedigree, the thorns are not particularly sharp and it would take some effort to actually injure yourself on them. 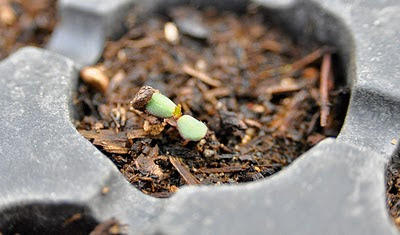 I have documented the left-most seedling in previous posts, labeling it as simply "Floor Moss". Click the link to see a photo. I'm using "Floor Moss" in breeding now, since it tends to be very clean and has great vigor. Oh yeah, and the blooms ain't bad either. Always one of the first to leaf out in the breeding house: Ralph's 'Joycie'. This is the main "stud house" where the majority of the breeding plants are concentrated. Every year a few plants get retired from service and a few new cultivars are brought into service. Right now I am finishing up the removal of last year's foliage and getting weeds pulled. (damned Oxalis!) this week I am seeing new foliage on a few things in this house. It's barely February!! !